Hello Stampers! Today I am sharing a multi-fold card for this week's Tuesday Throwdown challenge using Sugar Pea Designs' stamp set called Nuts About You for this week's challenge theme "more than one fold." I decided to make a side-step card, something I haven't really made before. It was a breeze. I used a combination of distress inks and Polychromos pencils to color in all of the stamped images. I then popped the image onto the base using foam tape for dimension. Make sure you pop on over to the TT blog to enter this week's challenge to win a fun prize package from our sponsor, Sugar Pea Designs and check out more inspirations from the DT. Really cute! 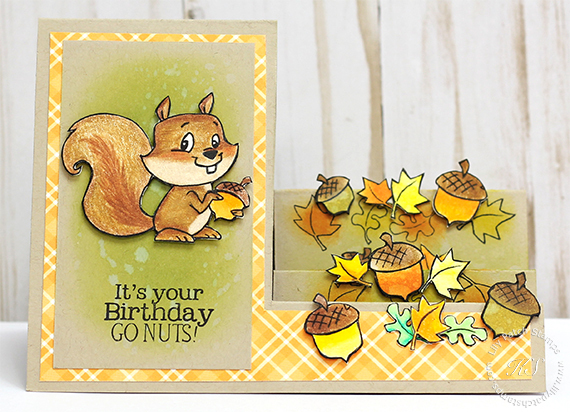 I love how you used the acorns on the step part of the card.